For curriculum vita and photo Dr. Blackman. Scoliosis is the medical term for curvature of the spine. This paper deals primarily with the surgical treatment of scoliosis. 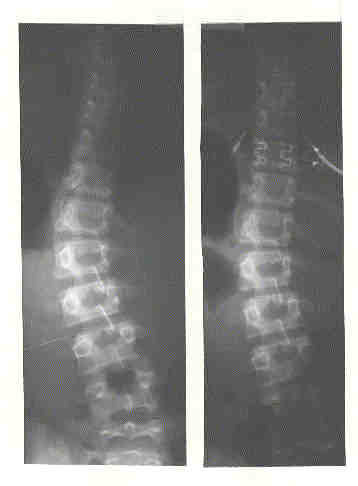 Xray pictures of scoliosis before and after treatment are shown. The thumbnail pictures of scoliosis can be enlarged by clicking on them. Scoliosis occurs in approximately 2% of women and less than 1/2% of men. It usually starts in the early teens or pre-teens and may gradually progress as rapid growth occurs. Once rapid growth (puberty) is over then mild curves often do not change while severe curves nearly always progress. 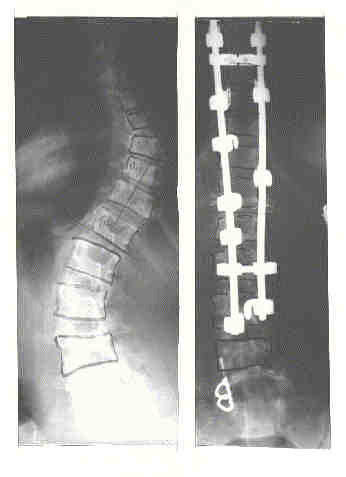 There is a fine line between the term scoliosis and a very mild curve in a normal spine. Curves are measured in degrees. Persons with a curve of ten degrees or less are often thought to have just an asymmetry of the spine - but in children who end up with significant curves we have to consider that they started with a straight spine so even a ten degree curve can progress to a fifty degree curve and a significant deformity, if there is enough growing time remaining. Persons with curves measuring under thirty degrees entering adulthood are considered having a mild curve while those over 60 degrees are considered severe. The treatment options depend on the severity and the age of the person. We can, of course, make up a long list of treatments; only a few have actually been shown to affect the outcome of scoliosis. Numerous studies have failed to show any benefit from exercise, manipulation, meditation or drugs. While exercise is beneficial to maintaining good muscle tone and a healthier heart and lungs, there is no evidence that it affects, one way or the other, the curve progression. It may help in reducing discomfort. Option 1. Do nothing. The decision to do nothing may be a reasonable decision depending on the age of the person and the predicted outcome. If the person is a teen or pre-teen and the prediction is that this curve will worsen then doing nothing may not be appropriate. Increasing curves usually give an increase in the deformity. That is the chest twists throwing the shoulder blade off in back causing a rib hump and the chest in front rotates as well causing unevenness to the breasts. At the same time the hips at the waist become more uneven. So doing nothing in the teen years may be disastrous. On the other hand, if the person has reached maturity ( physical at least!) then if the curve is mild, below forty degrees, it may not increase any more. So not doing anything may be okay. Option 2. Wear a brace. Bracing has been shown to be an effective method to prevent curves from getting worse. From a practical aspect though this treatment is reserved for children and adolescents in whom the prediction of a rapid increase in the curve needs to be thwarted. A brace worn 16 or more hours per day has been shown to be effective in preventing 90% or more of the curves from getting worse. Unfortunately, a brace worn 23 hours per day and worn properly does not guarantee that the curve will not continue to increase. Still, in curves that are mild i.e. between 20 and 35 degrees a brace may be quite effective. In adults, the curve may progress slowly over the years, bracing is not a practical solution to prevent curves from increasing. Mild curves under 30 degrees do not usually progress; severe curves over 60 degrees usually progress and scoliosis between 30 and 60 degrees may or may not progress. It must be remembered that a brace for a teenager is not an easy treatment. The brace is hot, hard, uncomfortable, ugly and while it normally can't be seen under the clothes definitely makes a teenager more selfconscious. We tend to use a brace for 23 hours per day. Using it part time seems to create problems of when to put it on, when to take it off, and for how long; whereas if it becomes part of the routine it becomes a standard function. Additionally, logic supported by data shows that the more the brace is on the better the chance of maintaining correction. NOTE HOWEVER THAT A BRACE USUALLY DOES NOT CORRECT A CURVE. AT BEST IT WILL STOP IT FROM WORSENING. There are numerous anecdotes from many kinds of practitioners, including ourselves, who have seen curves straighten both spontaneously and while using a brace. In medicine there are always exceptions. of a teenager in a brace for 18 months. Option 3. SURGERY: For those persons who already have a significant curve with a significant deformity surgery can reduce the curve and significantly reduce the deformity. Usually surgery is reserved for teen and pre-teens who already have a curve around 40 degrees or more. In our practice we tend to be more aggressive than many in doing surgery around 40 degrees while there are many excellent surgeons who defer to 45 or 50 degrees. In the adult age range the reasons for doing surgery are less well defined but include an increasing discomfort or pain in a curve that appears to have increased. For many women the deformity in the hip line and the increasing discomfort combine to make surgery a reasonable option. Many persons note the increasing deformity in the chest coupled with an increase in the rib hump. For those persons surgery can ( not always and certainly not guaranteed) reduce the deformity and the discomfort or pain. Surgery however is a big deal and not to be undertaken lightly. 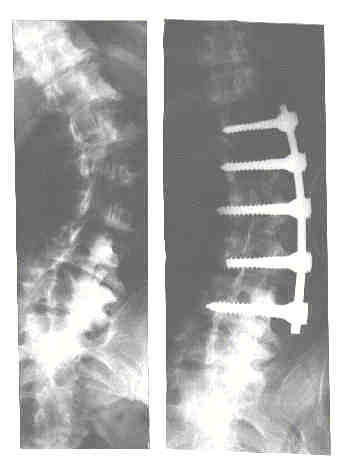 We invariably use metal rods and screws to help straighten and hold the spine in the corrected position. There are three major types of curves each with their own method of correction. However, what we do may not be what someone else would do. Surgeons base their procedures on many different factors including their experience with techniques and their outcomes. The usual scoliosis curve is a thoracic curve ( i.e. at the level of the chest.) In these curves the procedure is a posterior spinal fusion. A fusion is a procedure where the individual bones are made solid each to the one above and below. Typically 10 or more segments are included. 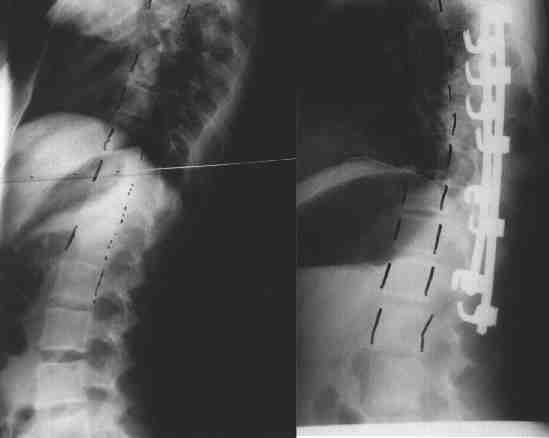 In order to first get as much correction of the curve, screws are attached to both sides of the back of the individual vertebra and then these are connected to two metal rods which have been pre-bent to the desired contour. The rod is then coerced into the head of each of the screws on each side so that there is a line of screws with a rod attached on each side of the curve. After the correction is done, little bits of bone are flaked off the back of the vertebra so that when healing occurs the flakes of bone cross and become solid. Some surgeons use extra bone obtained from the back of the pelvis. The metal rod hopefully holds the correction until it is solid approximately in one year. and after surgery with rods in place. Scoliosis is a three dimensional problem. It is easy to think of the curves from looking at the back or the front; but the side view also must be considered. Flattening of the normal roundness to the side view of the back affects the general look of the back and the person. One of the aims of surgery is to try to restore the normal contour of the back from both the front view and the side view. We have developed a technique to assist us in getting a maximum of correction with a minimum of scar and morbidity. We have developed the use of the endoscope to go into the chest (similar to the way surgeons take out gallbladders now) in front where the actual vertebra are and take out the discs in front thus loosening up the spine so we can get better correction when we do the fusion in back. 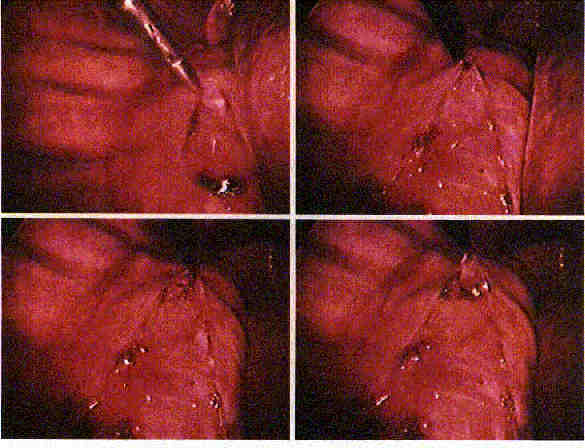 This is called ENDOSCOPIC DISCECTOMY SURGERY. This method goes in through the chest using three or four small incisions to reach the front of the spine. Once inside the chest the spine is clearly visible and "soft" tissues can be cleaned off exposing the spine. The discs are easily seen and can be removed. as seen through the endoscope. Click on this to enlarge the picture. ANTERIOR APPROACH: For those curves which present more as a distortion of the waistline or hips going in through the front of the abdomen can reach the vertebra and using screws the spine can be exceedingly well corrected ( again not always though). Going in through the front can often allow us to fuse fewer vertebra and get better correction. So we "save a level" and get better motion remaining and usually better correction than posteriorly. The spine is actually in the middle of the body and the larger weight bearing part of the vertebra is in the front. To correct the curve by going in front,the incision is across the chest in line with a rib and down the front of the abdomen for a short distance. It sounds like a big approach ( and it is ) but the actual incision is no longer than the one in back. The chest is entered and the area of the curve is identified. 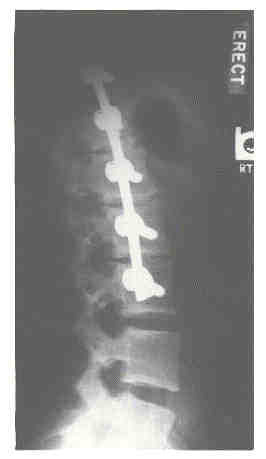 The discs are removed so that the curve becomes much more mobile and screws are then placed in the vertebra and connected together with a metal rod. Bone graft is placed in the space where the discs were so that later fusion between each adjacent vertebra will occur.The screws are then compressed together, shortening the distance on the outside of the curve and so straightening the curve. Usually fusion occurs in a shorter time than the posterior method and the number of vertebra fused are usually less. return of the center of gravity. This is a side view or lateral view. It shows the bodies of the vertebra with the screws and rod in place. Note the slight sway back which is built into the correction. And for those who have a double curve then often a combination of any of the above may be needed. That is, we may just go in from the back and fuse a long segment of the curves or we may go in from the front and fuse the lower curve and correct it and then fuse from the back or we may do all three procedures, to try to get the maximum correction possible. Paper presenting our results at two years. Some Good "links" to other discussions of Scoliosis. Film: "Scoliosis - An Adult Perspective" - discusses scoliosis in adults and gives the perspective of four women with scoliosis as well as a visual explanation of scoliosis. Film was made and produced by Kaiser Permanente. It is being distributed by the National Scoliosis Foundation and the Scoliosis Association. Film: "Understanding Scoliosis" similar to above but made for teens and pre-teens. Emphasis is more on bracing and living with scoliosis with participation by teens. Available through the National Scoliosis Foundation.